What does it look like to promote equity, diversity, and inclusion in national parks, national forests, and other public lands and water? What does it mean to manage public lands for environmental justice? 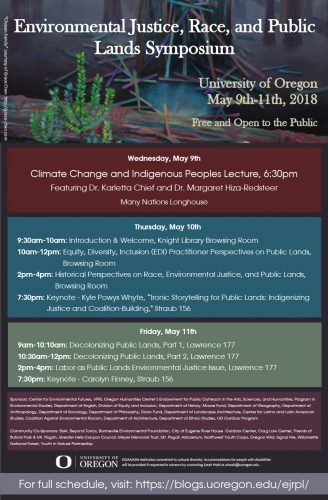 What are indigenous perspectives on public land management? What might a historical perspective add to our understanding? Please join us for this exciting event! More details are available on our Facebook page, as well as here. We envision a symposium focusing on issues of equity and environmental justice on public lands. We seek to bring together practitioners engaged in diversity, equity, and inclusion work throughout the Pacific Northwest with scholars focused on race, environmental justice, and/or indigeneity as they relate to public lands. 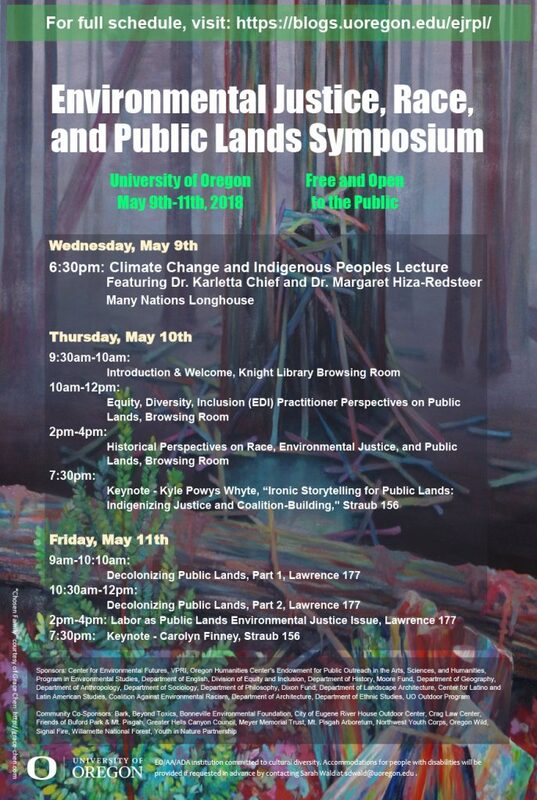 Our speakers position indigenous perspectives as central to any conversation about environmental justice and public lands. Given recent threats to defund public lands coming from the federal government, and the vexed nature of public land use (with distinct racial overtones) made clear by the Malheur conflict, we feel that this is a crucial moment to revisit the meaning of public lands for all Oregonians. Key questions we will pursue include: What does it look like to promote equity, diversity, and inclusion in national parks, national forests, and other public lands and water? What does it mean to manage public lands for environmental justice? What are indigenous perspectives on public land management? What might a historical perspective add to our understanding? For detailed schedule and additional information, click here.